“Shades of Bright Eyes and Ryan Adams, with lovely words and tunes.” - Jeremy Taylor, Radio New Zealand National. Miles Calder is a singer-songwriter from Wellington with an expressive voice and raw heartfelt songs. Nestled somewhere between Ryan Adams, Bob Dylan and Neil Young, Miles Calder & The Rumours’ brand of atmospheric Americana dresses Calder’s songs with striving harmonies and earthy tones. Miles Calder & The Rumours formed in late 2011, fuelled by the recollections of a fateful late night jam and a mutual love of folk-rock and Americana. Calder was joined by Nick George (drums), Steve Moodie (bass), Kirsten Moodie (vocals and percussion), and in early 2012 by Andrew Moore (electric guitar and vocals). In late 2013 the band released The Crossing Over EP, which was nominated for the 2014 NZ Taite Music Prize (Best Album) and Best Country Album. Calder also received honorable mentions in both the International Songwriting Competition and The John Lennon Songwriting Contest. 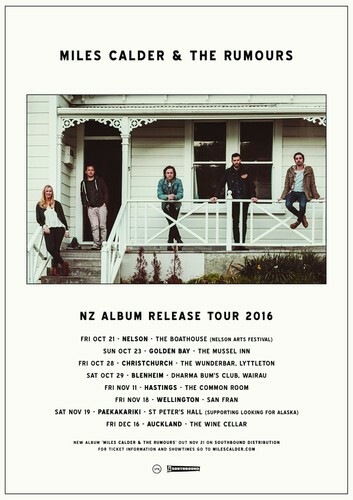 The band have since played numerous New Zealand festivals and supported Shakey Graves (USA), M. Ward (USA) and Fly My Pretties (NZ). Miles Calder & The Rumours now present their debut album (out November 21st). Recorded over a two-year period, which saw Calder spend a year living away in New York, and his debut European solo tour, this album shows a progression to a much deeper and more diverse sound. The fittingly self-titled debut is a picture of the band after four years playing together. A collection of strong songs at its core, the album draws on a rich palette of vintage instruments and vocal harmonies to create beautiful arrangements inspired by classic folk-rock albums of the early 70s. The album is available at the website. Show information available from the website.